Where'd you get all that hunny, you willy-nilly silly old bear? 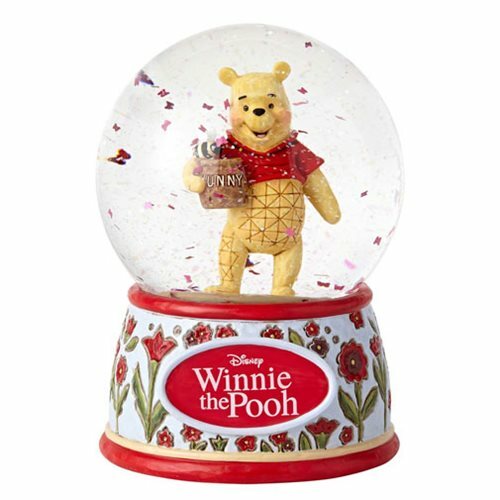 Winnie the Pooh cuts a classic figure in this Disney Traditions Winnie the Pooh 5 1/2-Inch Water Globe. Dressed in his signature red shirt, with hunny pot in paw, Pooh appears to walk across a field of flowers. Give the hand-painted base a shake to set the confetti astir all around him. What fun! Made of stone resin and glass, this adorable piece measures approximately 5 1/2-inches tall x 4-inches in diameter.